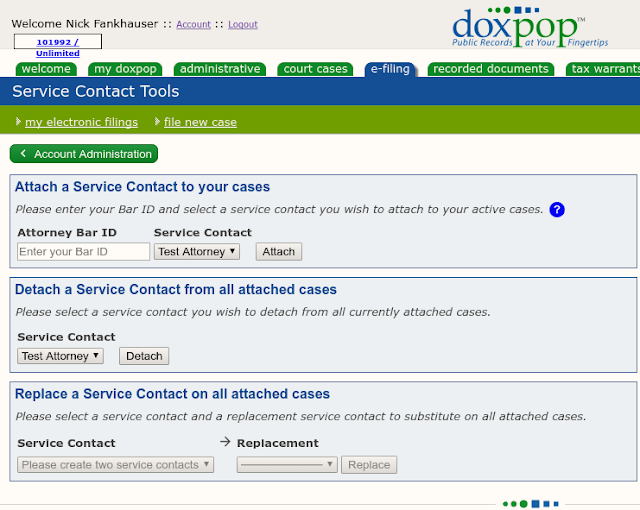 Doxpop - Tools for Attorneys and Public Information Researchers: Managing service contacts and preparing for new rules. Managing service contacts and preparing for new rules. 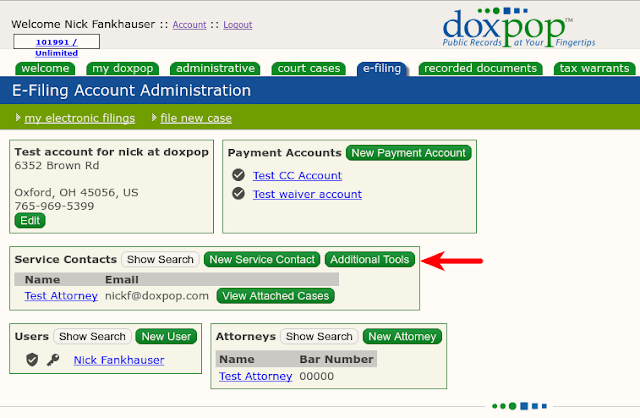 Last week, Doxpop added new tools for management of service contacts in batches to our e-filing account administration screen. Currently, when each county begins e-filing, none of your old (pre-e-filing) cases for that county will have your service contact attached. It is a hassle to attach those contacts manually, so our tools will allow you to automatically attach the service contact you specify to every case where you (or the attorney you work for) is the attorney of record for an open (pending) case. This lets you hit the ground running in every county. At the first of the year, Trial Court Technology has notified us that they intend to do away with public contacts managed by private firms. The only public contacts will be one for each attorney created based on the information found in the roll of attorneys. This change means that if you want to control how e-service occurs for your cases, you will need to make sure you attached your preferred private contact (that you control) before another person attaches the public contact that you don't control. The second two tools allow you to detach a service contact from all cases where it appears, or replace a service contact with a new one. This is useful in situations where an attorney is closing up shop or moving to a new firm. We'll post more guidance soon about the change in public/private service contacts that will occur on January 1. In the meantime, take a look at these new tools, and in particular, start using the first tool to make your work easier as each new county comes online. Please don't hesitate to give us a call at 866-369-7671 or email support@doxpop.com if you have questions about how to use these new tools. If you want to make sure you never miss an important blog post, please subscribe using the "Follow By Email" tool found near the top on the right side of this blog.